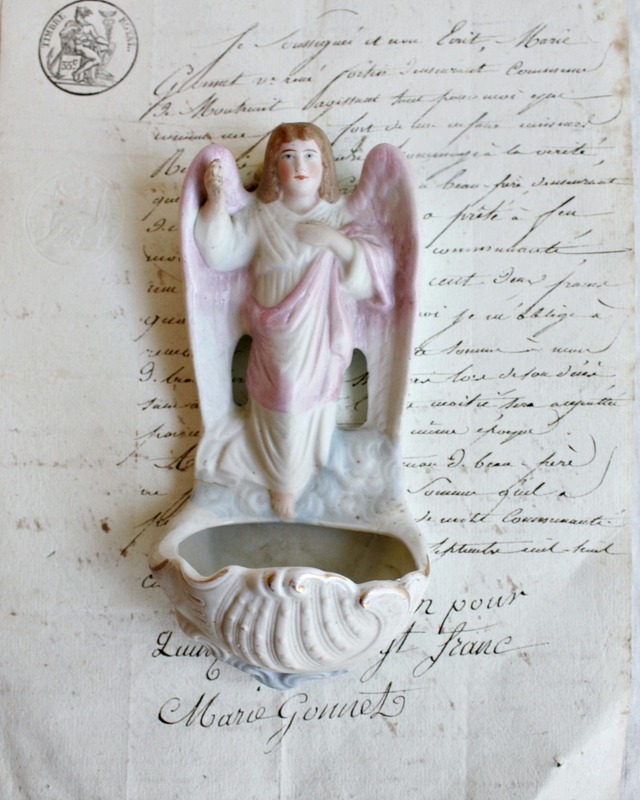 A sweet Antique Porcelain Holy Water Font for the bedroom of a child, made of bisque porcelain. Little Holy Water Fonts like this were given as a gift to a godchild, or grandchild, on their Christening Day in the late 1800's, early 1900's, and continue to be gifted. Made in Germany, this decorative font has an angel with pink wings and a pink sash, it was meant for a little boy. Pink was actually not for girls in the 1800's, but the color for little boys. The trade publication Earnshaw's Infants' Department “The generally accepted rule is pink for the boys, and blue for the girls. The reason is that pink, being a more decided and stronger color, is more suitable for the boy, while blue, which is more delicate and dainty, is prettier for the girl.” In good condition, with a blue tinted shell for the water. Marked Made in Germany incised on the back.